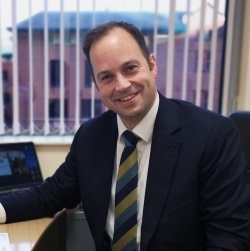 Mr Eyre is a Yorkshire trained Orthopaedic Surgeon with a special interest in disorders of the Foot & Ankle. He graduated from Leeds Medical School, and completed Higher Surgical Training in Yorkshire, with a focus on Lower Limb Orthopaedics, Trauma /Military surgery, and Foot & Ankle surgery. His training continued with Fellowship training in Foot & Ankle and Trauma surgery in Leeds, and completed with a Fellowship at the prestigious Avon Orthopaedic Centre / Sports Orthopaedic Clinic, Bristol. Here he acquired specialist skills in minimally invasive Foot & Ankle surgery; widely recognised to offer quicker healing and smaller scars. His achievements have recently been recognised at a national level, with the award of The British Foot & Ankle Society Travelling Fellowship to Zurich, Switzerland, for further training in sports and ankle joint replacement surgery. Mr Eyre has presented at numerous national and international conferences, and has contributed to scientific literature in Trauma, Sports injury, and Orthopaedic surgery. Mr Eyre is a keen teacher, and holds Honorary senior lecturer status at Leeds Medical School. He is a member of the Faculty of Surgical Trainers, and has a particular interest in designing computer software and simulators to aid surgical training. Outside of work, he enjoys golf, cycling, hill walking and skiing. Mr Jason Eyre does not hold a share or financial interest in this hospital, another Nuffield Health hospital or the company. Mr Jason Eyre does not have a share or financial interest in equipment used at this hospital or another Nuffield Health hospital. Mr Jason Eyre does not hold any paid advisory role(s) at this hospital or on behalf of Nuffield Health.